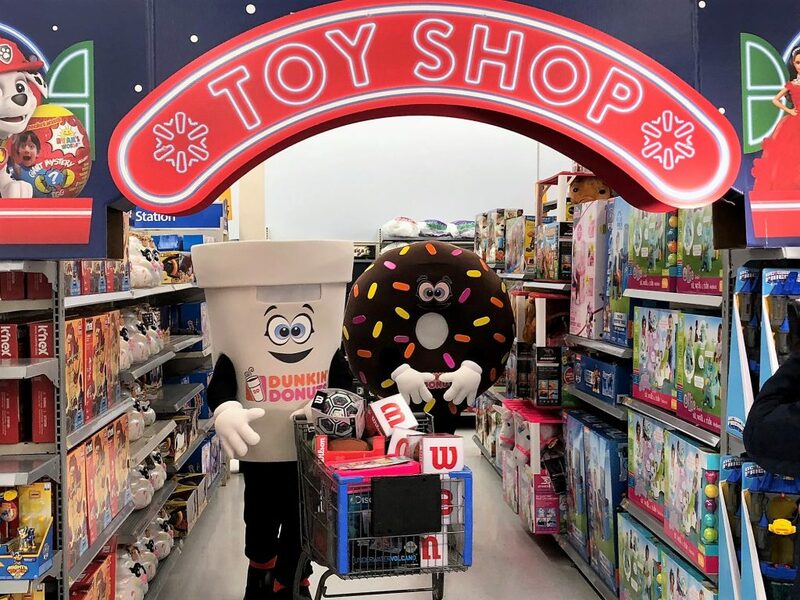 Dunkin’ mascots Cuppy and Sprinkles help local franchisees select toys. ALBANY, NY; – Dunkin’ franchisees and U.S. Marine volunteers today celebrated the season of giving during a $25,000 shopping spree at Walmart in Albany to prepare for the annual U.S. Marine Corps Reserve Toys for Tots toy distribution throughout New York State. Made possible by a recent contribution of $25,000 from local Dunkin’ franchisees to the Toys for Tots Foundation, the gifts will be distributed to thousands of children and families across the state ahead of the 2018 holiday season. Dunkin’ franchisees also donated an additional $5,000 to purchase coats for children this holiday season. Dunkin’s most recent contribution marks the 10th consecutive year that Capital Region franchisees have provided support for the U.S. Marine Corps Reserve’s signature holiday campaign, bringing the grand total over that span to nearly $300,000 in support of the Toys for Tots initiative. The Marine Corps Reserves’ Dunkin’ Toys for Tots Train, powered by Norfolk Southern Railway, will travel from Binghamton to Delanson to distribute thousands of toys and winter coats to local non-profit organizations and children in need on Saturday, December 1. The second leg of the journey between Saratoga Springs and Rouses Point will be held on Sunday, December 9. Additional details about this portion of the toy distribution will be forthcoming. The Marines will work with more than 200 community agencies to distribute toys this holiday season and will be equipped to serve 200,000 children. The Toys for Tots collection drive is currently underway at more than 400 locations throughout the Capital Region, as well as at more than 100 Dunkin’ restaurants, which serve as drop-off points for guests wishing to donate new, unwrapped toys. The Toys for Tots Foundation receives additional support from a number of companies and organizations throughout the greater Capital Region, including Auto Solution, SEFCU and Seymour’s Motorized Sports. Additionally, the family of Wayne Wagner is donating warehouse space to serve as the home of the 2018 Capital Region Toys for Tots program. Clifton Park & Halfmoon EMS, and members of the Saratoga, Washington, Albany, Fulton, Essex, and Clinton Sheriff’s Departments also provide support to the Toys for Tots campaign. Saratoga County Sheriff Michael Zurlo will host the fifth annual Saratoga County Sheriff’s Department Convoy for Tots on Sunday, November 25 to benefit Capital Region Toys for Tots. During the 2017 event, more than 10,000 toys were donated. To learn more about Dunkin’ Donuts, visit www.DunkinDonuts.com or follow us on Facebook (www.facebook.com/DunkinDonuts), Instagram (www.instagram.com/DunkinDonuts) and Twitter (www.twitter.com/DunkinNYCAP).